Wins for Middleton, Bognor and Stirlands all feature in our round-up from the top five divisions of the Sussex League. Don’t miss the Observer every Thursday for all the local cricket reports, pictures, tables, fixtures and results. Middleton recorded what many will rank as one of their best-ever victories as they beat leaders East Frinstead. The hosts began the day in bottom place as Sean Heather won the toss and decided to bat first. The pick of the Middleton bowlers were Heather, who finished with 4-26 from his ten overs, Fowle (2-17 from 7) and Smith (2-6 from 5). Ian Sturmer removed Stuart Nelmes in his first over, lbw for just one. Nick Smith looked in good form scoring 23 from 25 balls before he was given out lbw to Fynn Hudson-Prentice, the second of five lbw decisions Middleton would suffer. Mahesh Rawat put on 59 with Patrick Colvin for the fifth wicket and continued with his innings until he was out lbw for 63 off just 57 balls. Middleton were 131-6 at that stage. Lower-order contributions from Charlie Terry (12), Matt Reynolds (15) and particularly Craig Fowle (28no) took the Middleton total to 195 at the fall of the final wicket in the 39th over. East Grinstead in reply lost their first wicket at 14, Tommy Davies having skipper Will Atkin caught behind by Rawat, the first of four catches he was to take. In the tenth over Heather replaced Davies and in the following over Fowle was introduced. From the fifth ball of Fowle’s first over, Heather diving at short extra cover dislocated a finger in stopping the ball. There followed a break whilst attention was sought for the injury and Heather left the field. He was back, however, in time for the next over, which was to be a major turning point in the game. Hudson-Prentice was caught behind of the first ball of the over for ten and then Bradley Hatchett was bowled for 22, leaving the visitors 49-3. Wickets continued to fall with only Rob Glaysher showing real resistance, being last man out for 27. East Grinstead were all out in the 39th over with the score on 125. Derbies never fail to produce dull games and this encounter proved no different. Sunny skies greeted the players and the visitors won the toss. The first ball was an indicator of things to come as Bognor’s Jamaican fast bowler Marquino Mindley trapped Peter Lamb lbw. Another wicket for Mindley and a disastrous run out left the hosts shellshocked at 1-3. Things didn’t improve in the next few overs, runs rarely coming off the bat as the ball dominated. Two more wickets followed and at 31 for 5 it had the makings of a very short game. But Jay Hartard (70) and Magnus Kristensen (30) showed fighting spirit, putting on 88 for the sixth wicket. Two Bognor bowlers fell victim to the new rules regarding full-pitched deliveries, both of them removed permanently from the attack for bowling two beamers. When Hartard and Kristensen departed in quick succession, Hindley (4-15) returned to finish off the tail as Chichester were bowled out for 162. Chichester were missing a few key bowlers and that showed. They managed to reduce Bognor to 35-2 but the bowlers struggled to make further inroads. Charlie Laforet (41) and Ryan Maskell (79no) took the game away from Chichester in very quick time. A couple more wickets were claimed by the hosts but they were nothing more than consolations. Bognor wrapped up a comfortable six-wicket victory with 15 overs to spare. Chichester are in the bottom half but it’s early days. This week they visit one of the favourites for the division-two title, Mayfield. West Chiltington batted first and got off to a brisk start but Pete Cotterill stemmed the flow of runs with three early wickets and Sean Rutter chipped in with two quick wickets to leave the home side 92-5. A partnership of 89 between Tim Van Noort (69) and Richard Harris (64) took the game away from Pagham. The introduction of Rico Webb and Rutter saw the last five wickets eventually fall for 51, Rutter finishing with impressive figures of 5-32. Pagham required 233 to win but what’s now a recurring tendency from the top order to play rash shots soon saw Pagham stumble to 92-8. The two colts in their line-up showed the senior players how batting should be done by putting on 41 for the ninth wicket, Alex Mackay top-scoring with 26. Pagham ended 135 all out, losing by 07 runs. Mithelesh Rawat took 5-19 and was the pick of the Chilt bowlers. Bridges won the toss and Stirlands were invited set a target to chase on a surface that wasn’t showing any signs of the months of rain, thanks to groundsman Phil Robinson. George Briance and Torquil Deacon both fell cheaply to Iain Roe, leaving Stirlands 24-2. Briance was unlucky to be stumped as the ball ricocheted off the keeper’s ankle and trickled on to the stumps. William Gubbins and George Coles had to contend with theline and length of Adrian Chappell but after 15 overs, the home side were building a platform at 45-2. Coles fell to penultimate ball of Chappell’s spell to leave the home side 52-3, bringing the in-form Jamaine Bullen to the crease. Stirlands drastically increased the run-rate as Gubbins began to pick off the bad balls, the highlight a carefully lofted extra drive to bring up a half century with a maximum. Bullen played well and the partnership soon reached 100 before the batsmen started to deposit each bowler into the neighbouring graveyard with increasing ease. Gubbins brought up a well-crafted century before being bowled for 124 from 136 balls, with 18 boundaries. The score was 268-4 and Bullen showed no mercy. Ed Clarke struck his second ball for six before Bullen advanced to his maiden Stirlands century to the delight of the locals. The innings finished on 306-4. Coles and David Briance opened the bowling for the hosts and the canny Briance had Ian Church caught at extra cover by Clarke off the fifth ball of the innings. 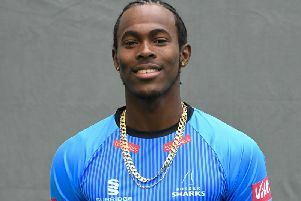 Briance collected the first four wickets of the innings in his nine overs to leave the chasing side in all sorts of bother at 58-4. Dom Fecher bowled with control and was rewarded with a wicket of his own. Young George Briance wrapped up the game from the Sea End, picking up his fourth wicket to dismiss Three Bridges for 124. Another 30 points left Stirlands joint top. Saturday sees the first XI away to Steyning. West Wittering travelled to early title contenders Southwater for their first league meeting in the club’s history but suffered a heartbreaking loss. Southwater put them into bat and Liam Bates and Jake Irwin-Brown opened. Irwin-Brown got off to a flyer, taking the attack to the Southwater openers, but was caught after a quickfire 19. Bates (21) played the anchor role and when Charlie Caddy joined him, he raised the run-rate and formed a good partnership. Some big hits and clever batting from Caddy saw the youngster score his maiden first XI 50, scoring 58. Later, new boy James Munro came in and bashed 31 off 20 balls and Steve Day hit a quick 20 to help Wittering reach a competitive total of 214. Southwater opener Baker came out with one intention – to take the game away from Wittering. He blasted 50 off 42 balls and Wittering were feeling the pressure. It took a great catch Steve Day, sliding on his knees, to change the game. With strong bowling from Joe Pink (4-29), Tim Osborne (2-43) and James Staight (1-44) the game was turning in Wittering’s favour. The match went to the wire, with Wittering needing one wicket and Southwater four runs from the last over. With two balls remaining, Shuttlewood (28*) got the runs required.